The Smithsonian Institutes's flyer advertising its IMAX theater. The dinosaur in the photo comes from the Creation Museum. As I have been surfing the blogosphere over the past few days, I have seen three stories that relate to atheists being upset. I’ll start with the first one, which is both ironic and hilarious at the same time. 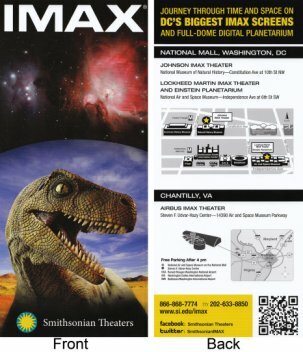 It seems that the Smithsonian Institute has produced a flyer (shown on the left) promoting its IMAX theater. To entice the reader, there is a prominent picture of a dinosaur on the front cover. I am sure the marketing department chose the picture because it is so realistic. Here’s the problem for the Smithsonian: the picture is of a model from the Creation Museum, which promotes young-earth creationism! I find this particularly funny, since the Smithsonian has attacked the museum on its blogs. If there is a nexus of all the misinformation and propaganda against science and progressive education it is about 10 miles…education in general…it’s about 10 miles down the road. Smithsonian people, I know it’s just a picture of a random dinosaur and you would never endorse Creationism garbage, but you’re getting the image from people who wrongly believe dinosaurs lived with people. To me, it’s not surprising that the Smithsonian unwittingly used a picture from the Creation Museum. While there are things in the Creation Museum with which I strongly disagree, overall, I found it to be significantly more scientifically accurate than most museums, including the Smithsonian’s National Museum of Natural History. Thus, it’s not surprising to me that they found one of the Creation Museum’s dinosaur models to be an accurate depiction of a dinosaur. Obviously, the pattern of the columns is intriguing, so the formation gets a lot of attention. Old-earth scientists have their explanation for how and when it formed, while young-earth creationists have their explanation. 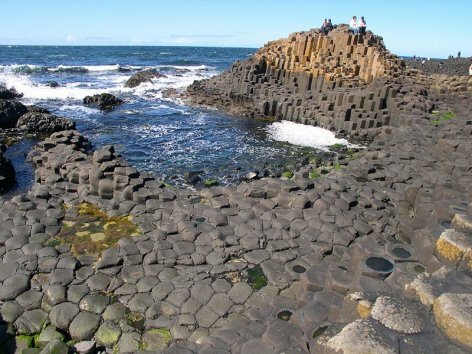 In other words, the formation of the Giant’s causeway is controversial among scientists. The story centers around the fact that the UK’s National Trust decided to mention this controversy in its new visitor exhibition. According to the story, it doesn’t give the young-earth creationist view. It simply mentions the fact that some people disagree with the old-earth explanation. Well…that doesn’t sit well with the archbishops of evolution. Both Dr. PZ Myers and Dr. Jerry Coyne went apoplectic, bashing the National Trust for daring to inform the public that there is a controversy. This, of course, is simply a reflection of the weakness of their position. They get angry whenever someone even mentions that there are those who disagree with them. After all, mentioning the controversy might cause people to look at the alternative position, and the archbishops of evolution can’t allow that kind of open-mindedness! It threatens their dogma. Of course, you can’t discuss upset atheists without bringing up Dr. Richard Dawkins. He has been in a tiff with Dr. Edward O. Wilson, a scientist of superior credentials who has actually done a lot of good research that has aided science in its understanding of the natural world. Why the tiff? Because Dr. Wilson disagrees with him. While Dawkins is convinced that the only possible way natural selection can work is on individual genes, Wilson is convinced there is more to what natural selection can do. He thinks that natural selection can also work on groups of organisms. Well, Dr. Dawkins is quite upset that anyone would dare to criticize his hypothesis-stated-as-fact. As a result, he wrote a blistering critique of Wilson’s latest book. If you slog through the article, you will find that Dawkins actually tries to claim that Wilson doesn’t understand evolution! Saying that Wilson doesn’t understand evolution is much like saying a JPL engineer doesn’t understand propulsion. Wilson knows evolution better than most scientists, including Dr. Richard Dawkins. The problem is that Dawkins can’t effectively argue for his positions, so instead, he simply has to say that anyone who disagree with him doesn’t understand evolution. That goes for creationists, intelligent design advocates, and even other evolutionists who don’t meet his standard of orthodoxy. While I obviously disagree with Dr. Wilson on most of his interpretations of the data, I can wholeheartedly agree with that statement. Science isn’t about majority vote. It is about the data. As more scientists realize this, evolution will go the way of phlogiston and geocentric maps. Can you give some examples of things the Creation Museum is wrong on? My family is planning to visit in the near future, so I would appreciate some forewarning. 1) In the part of the Museum that tries to portray what happened to the U.S. when the Bible was abandoned, there is a wrecked church. It has been hit by a wrecking ball, and the phrase on the wrecking ball is “millions of years.” According to the museum, then, an old earth is what has destroyed the church. I see that as nonsense. There are a lot of things that have harmed the church, and an old earth doesn’t even make my top 20 list. In my mind, the number one thing that has harmed the church in the U.S. is the way most Christians in the U.S. (including many young-earth creationists) behave. 2) There are several places where the signs say that no animal died before the Fall. It is stated as fact when, at best, such an idea is an extraBiblical notion. Nowhere does the Bible even imply that animals did not die before the Fall. I think the idea that animals did not die before the Fall is taken from the first half of Romans 5: 12 “Therefore, just as sin entered the world through one man, *and death through sin*…” [emphasis mine]. I think it’s possible that animals lived forever before the Fall, but half a verse is an awfully small thing to hang the theory on. There might be other verses that say similar things, but I don’t know of any. Keith, as I discuss in this article, Romans 5 is talking specifically about human death. The way the Greek word for death is used and the context makes this very clear. I think the reason at least some of the evolutionists are angry that disagreements about the Causeway are mentioned is because they see it not as legitimate scientific criticism where it belongs- but as another instance of giving “both sides” equal time and thus equal legitimacy in the eyes of the public. As you have said many times, science is not a matter of polls, opinions, or “sides,” but of data. What explanation is most consistent with it in the simplest manner? Just telling the public that there is a controversy without a discussion of evidence with sufficient background science like the park seems to be doing only contributes to science illiteracy. The public often won’t see any difference between this and claims that the world will be destroyed by an imaginary planet or brown dwarf this year. “Some experts say this, and others that,” they might say. “Each should deserve equal media attention.” This is not good for our society. Teaching critical, but not cynical/skeptical thinking, and evidence/interpretation-based science will encourage science. Thus, I think the park should come right out and list the evidence of the YEC scientists alongside that of the mainstream view and an explanation of how science works instead of mentioning disagreement. Truth will win in the long-haul. WSH, I understand what you are saying, but I have to disagree. According to the article, the exhibition is not giving equal time to the young-earth creationist view. It spends the majority of its time on the old-earth view, and twice it refers to young-earth creationists as “some people,” indicating that they are a minority. Also, by not giving the young-earth argument, the exhibition is giving the young-earth creationist view less time. Now I agree with you that the exhibition should give the evidence for both sides, but I do think that at least mentioning there is a controversy is more honest than giving the old-earth side and saying nothing else! I had no idea. It seems that Dr. Richard Dawkins and Sir David Attenborough are thrilled, at least according to The Guardian. It is so neat that the Smithsonian used a picture of the dinosaur from the Creation Museum! I recognize that dinosaur from when I got visit. I got to go to the Apologetics Conference last year and visit the museum I think three different times. We took lots of pictures but it really doesn’t do justice . . . Mom and I are planning to go this year at Christmas for the nativity, Lord willing! That sounds great, Teej. I have never been down there for the nativity. An additional academic nit-pick of the Creation Museum…. The Ark exhibit was nicely done, and more reflective of ANE work than I would have expected from the Creation Museum. I ran into issues with the part with the Hebrew prophets, with one apparently representing Moses (though looking decidedly more Causasian), holding the Ten Commandments, with five on one tablet, and the other five on the other. This was done in modern Hebrew… with vowel points. As any Hebrew scholar can tell you (not that I am one, but I’ve heard it from them in seminary), vowel pointing came about no earlier than around 100 AD. Moses, coming down with the tablets, in his ANE context, would have had two identical tablets (a “divine” copy, and one for the people), not ten lines divided onto two tablets (what, can’t the LORD write small enough?!). The Hebrew (or whatever Semitic variant) on the tablets would not have had vowel points, much less look like nice, pretty Hebrew. It would have appeared much more primitive. Some might say that’s a small point to nit-pick. Indeed, it is. It’s a small detail. BUT…if Ken Ham, and the folks accountable to him, are so sloppy with such small, fine academic details…then good heavens, what ELSE have they screwed up? Kennethos, I love your avatar! However, I don’t think I understand your reasoning. I will take your word for the fact that the Hebrew in the display is anachronistic. However, that seems to be a very obscure fact. Even you admit that it is one of the “small, fine academic details.” In general, I can forgive a museum, book, article, or speaker for mistakes when it comes to the small, fine academic details. As a result, I am not sure what it means that they got such a minor point incorrect. Disclaimer, I came here from Ken Ham’s blog, but I wanted to check out what you were actually saying because I just saw your Science books and was impressed. We’re seriously considering purchasing them when our kids are a year or two older. I’m wondering why you want animals to die before Adam’s sin? What does this do for your theology? Or is this just because you don’t see any Biblical proof? If the later is the case, there is yet another passage to back up AiGs position. Just a little later in Romans 8:19-22, Paul clearly describes the futility that the whole of creation (animals, minerals, stars, etc) has been subjected to waiting for their redemption and ours. If the restoration of nature is connected with our coming sinlessness, it follows that their deconstruction came about because of our sinfulness. I’ve never been to the Creation Museum, like I said my kids are little and the price of admission isn’t. I came to the same position they hold by studying Romans in my early teens. Hi Cheri. Thanks for your kind words regarding my science books. In answer to your question, I don’t “want” animals to die before sin, and I typically don’t try to interpret Scripture based on what it does for my theology. The Bible simply doesn’t mention animal death before the Fall. It mentions human death before the Fall, but that’s it. I agree that Romans 8:19-22 tells us that all of Creation is affected by the Fall. Indeed, as the Scriptures tell us, Creation groans as a result. However, that doesn’t mean animal death is a result of the Fall. Indeed, it seems to argue against it. After all, Romans 8:19-22 is discussing all of Creation, but we know that plants died before the Fall. So if this passage were talking about death, it would have needed to make an exception for plants. In addition, stars, minerals and the like don’t die. Once again, then, this passage doesn’t seem to be discussing death. It seems to be discussing the general corruption of Creation that has led to suffering in the form of disease, parasitism, mutation, etc. Last I knew if you dug up a dinosaur bone it does not come with a tag. What it looked like, how it died, how old it is….that is all opinion. Guesses made on guesswork. The starting point of radiometric dating…guesswork/opinion. Not based on data as anything that happened in the past and is not happening now can’t be tested nor repeated nor falsified. In other words it is opinion based on a presupposition. That the earth has to be old. Also, on the issue of death before sin. God could not call the creation “Very good” if there was cancer, disease and death. Right after that, Genesis 2 goes into more detail about day 7. That is when Adam and Eve sinned. Craig, I disagree with the results of radiometric dating (I believe in a young earth), but I wouldn’t call it “guesswork.” It is a scientific process that is built on assumptions. I think those assumptions are incorrect, which is why radiometric dating gives inconsistent results. However, it is certainly more than guesswork! I don’t think it follows that there was no death because God pronounced Creation as “very good.” According to the Hebrew scholars I read, that same phrase (meod tob) is translated in other parts of Scripture as “pleasing,” “blameless,” or “what seems best.” It can also mean, “this works really well.” Thus, I don’t see how it implies a world without death. The term, kennethos, is “Caucasian” not “Causasian”. Some might say that’s a small point to nit-pick. Indeed, it is. It’s a small detail. BUT…if you are so sloppy with such small, fine academic details…then good heavens, what ELSE have you screwed up? Kenneth, it does seem like you are nit-picking. You make a good point, but fortunately, I’m sure that most people won’t even notice this so in some ways it is a harmless mistake as few people will be misinformed. Why don’t you write to them and ask them about it? Perhaps they will fix it and make the museum even better? I guess I don’t follow the logic of your last sentence. If it is one small detail, then how does that transfer to sloppiness? Sure, there probably are other mistakes as well, but don’t you think that is true of all museums? If it were a big mistake, then I can see the word “sloppy” being used, but one gets the impression that you are just looking for something to criticize. However, again, if you can find other mistakes, I’m sure they would be happy to fix them. Please do let them know of this problem. About the dinosaurs co-existing with humans, perhaps Genesis 1:24-27 might help solve the problem. God records for us in His Word He created man and ALL land animals on the same day so I think that is where this idea comes from. Hehe, Jim. I guess great minds think alike. I had the same problem understanding kennethos’s logic. Thanks, Mr. Ashley Haworth-Roberts. Unlike Mr. Ham suggests, I have represented the Creation Museum correctly. I did not “breeze through” the museum. Instead, I was given a behind-the-scenes tour before the museum opened, and I have led two student groups and one individual student through the museum. Thus, I am very familiar with the museum, and I am not misrepresenting what is presented in any way. Glad that you agree with the conclusion that I had already reached! PS Don’t particularly mind if you don’t publish this further comment (I criticised part of your blog in the link). Mr. Ashley, I have no problem with negative comments about my blog. I am a big fan of people reading all sides and coming to their own conclusions. I have written and deleted this a number of times and ask for forgiveness in speaking to you in this public forum about a private matter. I have been praying that you will be able to forgive Ken Ham for whatever he has done that has personally offended you. Your disunity over the years seems to be less about facts than about feelings. Your compliment about the Creation Museum being more accurate than the Smithsonian was very generous though your preceding comment was critical in a way that seemed to be more gossip than grounded. Your follow up revealed two rather small areas where you disagreed. I am reminded of that sad month of March 2011 and ask you to humble yourself, repent of your divisiveness, forgive Mr. Ham and offer him an apology. We have used your curriculum for years and feel a great fondness for you and thankfulness for your ministry to our family and many others. You are a very intelligent, educated, confident, well spoken man who appears to pursue God’s truth. It would be fair to say the same about Mr. Ham. It would be wonderful if the love that you had for each other, because of your mutual love of and from our Savior, was an even louder, stronger testimony to the love of the Father than your academic works. The things upon which you both agree are so much more beautiful and important and worthy than those few on which you disagree. Think on them, and let love season your future comments, so that by this all men will know that you are His disciples. Praying for peace for and between all of His faithful servants. J Wadman, I appreciate your comment, but you seem to misunderstand this situation. Mr. Ham hasn’t done anything to me. I have absolutely no ill will towards him whatsoever. I simply disagree with some of his theology. I was asked where I disagreed, and I answered. You are certainly correct that the things about which we agree are much more beautiful than the things about which we disagree. That’s why I link to the Answers in Genesis website despite the fact that I disagree with some of their theology. Indeed, that’s why I often refer people to Answers in Genesis. They are an excellent organization. However, I don’t think they are right about everything. They don’t think I am right about everything, either. That doesn’t lead me to believe that they have something against me. W. Brown, I do think I paid the museum a compliment. That’s certainly how I meant it. I also don’t see disagreement as having such a negative connotation. For example, one of my favorite authors these days is David Berlinski. I disagree with him on a lot of things, but that doesn’t keep me from absolutely loving most of his work! Greetings Dr. Wile, I’m a highschool student and your science books got me super excited about the subject. So much so that I now want to be a chemist. I love the way they’re written, they’re so fascinating and inspiring. I can’t wait till I start Advanced Chemistry later this year. I’m also a huge fan of Answers in genesis and Mr. Ham. Anyway I read over his blog post and your replies to the animals dying situation. I didn’t know that the original phrase was meod tob, and my question is do you think God’s saying cancer and disease(which are a part of the fossil reccord) are “very good”(meod tob)? Hi Elise. Thanks for your kind words regarding my books! In answer to your question, I don’t think cancer and disease were a part of God’s initial creation. I think they are a result of the corruption caused by the Fall. However, that tells us little about whether or not animal death was a part of God’s initial creation. Cancer and disease are not the only ways that animals die. Also, I am not a paleontologist, but I seriously doubt that we can determine cancer from fossils. Even if we could, however, that has little bearing on the pre-Fall world, as the fossil record is, in my mind, the result of the Flood. Thus, it is showing us a post-Fall world. I’m glad I found your site, via Answers in Genesis. So I can read up on this more, could you reference any posts or articles which would share more about your perception animals might have died before the fall. While I don’t share your view, I’m always looking to understand other opinions since I don’t know everything! It doesn’t seem to me like it’s a fundamental issue seeing as you also seem to believe in a young earth and literal six day creation. Actually my only concern (issue is too strong a word) with your comments regarding the Creation Museum would be your dismissing “millions of years” as being a significant issue. From my thinking, even “the way some Christian’s behave” can be partially linked to millions of years. We have all heard Christians justify their extreme violations of scripture with the words “I think God…”. Too many Christians think they can interpret scripture on their own because even the Church is telling them the Bible is not always accurate or that we can reinterpret scripture. I have read much of AIG’s research and the first two chapters of Genesis are at least arguably as responsible for the way people behave as any other issue. That is debatable of course, but it is a very legitimate argument. William, here is an article I wrote regarding how no animal death before the Fall is, at best, an extraBibical notion. I will certainly have to disagree with you that the idea of millions of years affects how Christians behave. You might argue that evolution affects how people behave, because it can foster the idea that people are just “glorified animals.” However, I know many, many old-earth creationists who believe in millions of years but have no such concept. Mr. Art Jackson: you’re absolutely right, my spelling mistake, my bad! Now, please, answer the issue I addressed. Otherwise, that’s called an ad hominem attack, leaves you feeling better about yourself, without actually addressing the issue. Dr. Wile: Glad you have good taste in British matters, sir! My reasoning is akin to “DaVinci Code”: it’s well known in academic circles that Dan Brown had many small (major) mistakes describing places around Westminster Abbey…publicly known places that should not have been an issue. He was sloppy on the fine details, which a publishing house fact-checker should have caught. I’m being exacting, yes; secularists will be no less forgiving. Ought we to treat the museum with kid gloves, since it’s a “Christian” museum? In my book, the standards gets raised therein. Relating to the Creation Museum: Ken Ham has aspired for excellence, which I applaud. This somewhat covers for an abhorrent lack of evidence and proof in other areas. I pointed this out on the Creation Museum website, and did indeed let them know (be a bit of a rude hypocrite if I didn’t). Thus far, no response. I’m an old-earth creationist, and appreciate (most of) the works of Ken Ham, up until he sends naive, ignorant Christian kids out to secular universities unprepared for the possibility the universe is older than, say, 6-10,000 years old. I fear for him before the throne of judgment, if he bears responsibility for kids possibly losing their faith because they’re brought up on extra-biblical issues like no animal death before the fall and dinosaurs living with humans (no real exegetical evidence or proof). People can yell at me all they want for reading the Bible and grasping that the universe is not a teen-ager. I see a cult of personality forming around AiG, and a severe lack of logic and thought. No wonder Christians are mocked…we’re being taught the first book of the Bible is off-limits to critical biblical thinking and reasoning, much less scientific explorations. We are strait-jacketed by folks with a faith so delicate and immature they somehow cannot accept anything but extra-biblical thinking. Sorry….off my soapbox. By the way, check out the works of Dr. Michael S. Heiser (Hebrew/Semitic languages scholar) for some interesting thoughts on origins and Rom. 5:12. Just google The Naked Bible blog….it may blow your mind. Thanks for your clarification, Kennethos. As a child, when I said that I wanted to be a “doctor,” I was talking about the kind that traveled in a TARDIS! I guess I see a difference between the DaVinci Code mistakes and the one you pointed out at the Creation Museum. As you say, the DaVinci Code mistakes are publicly known. Thus, anyone doing a modicum of research should not make such mistakes. The mistake you pointed out at the Creation Museum seems to be a rather obscure fact. That’s not to say it isn’t important. That’s just to say it doesn’t necessarily indicate a lack of solid research. I am glad that you alerted the Creation Museum to the mistake. Hopefully, that will cause them to research the issue and correct it. I will have to disagree with you when it comes to what Christians are being taught. I don’t know any creationist (including those at Answers in Genesis) who says that “the first book of the Bible is off-limits to critical biblical thinking and reasoning, much less scientific explorations.” In fact, the Answers in Genesis team is very big on scientific exploration regarding Genesis. I think their exploration is a bit more narrow than it should be, but it is most certainly there. 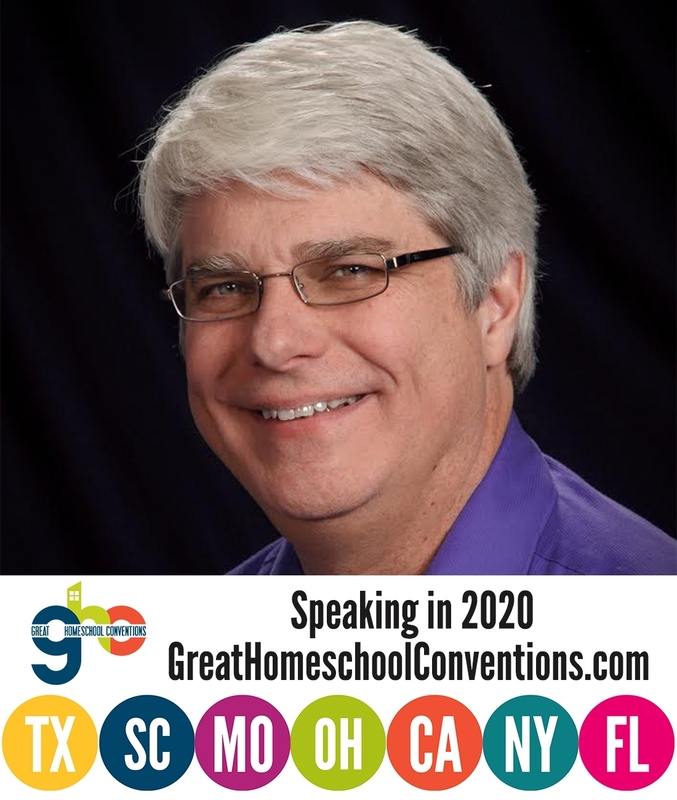 I will check out Dr. Heiser’s work. I haven’t heard of him and am always interested in expanding my reading list! You mentioned in your article that when the atheist gets mad instead of arguing his position that it is because of the weakness of his position. But couldn’t this also be argued on the side of a creationist when they get angry (as we’ve seen with Mr. Ham)? Perhaps it is just a manifestation of human frustration on both sides when this happens. At least I think it demonstrates the possibility the reaction doesn’t have to do with the validity or truth of a particular worldview. I for one enjoy good discussion, even though I too get frustrated from time to time. Keith, I would say that the difference is that creationists spend a lot more time iscussing the data and a lot less time hurling insults. Yes, all sides get frustrated and angry from time to time, but most of the ridicule that I see comes from the atheists. The more time you spend on ridicule, the less time you spend on data! I’d say that if you spend your time at PZ Meyers’ site (which I see you have linked to at the top) that might be the case. But perhaps that has over biased you. What about sites like talkorigins? That has quite a lot of talk about the data if I’m not mistaken. That isn’t even necessarily atheist based. What about the Christian based biologos? I just dont think you can use the frustration as a point of invalidity. Keith, I was specifically discussing atheists and the kinds of arguments they use. I read a lot of atheists, not just Myers and Dawkins. Most of what I read is long on ridicule and short on substance. While talkorigins does discuss a lot of data, an enormous amount of what you find on that site is deceptive misinformation (see, for example, here, here, here, here, here, and here). Biologos doesn’t contain much misinformation, but it also doesn’t contain much in the way of convincing arguments. I don’t use the frustration of atheists as a point of invalidity. I see it as a symptom of the fact that they cannot defend their case very well. Yes sir, that’s true cancer and disease aren’t the only way things die, and I’m also not a paleontologist. (obviously haha) I also beleive they’re a result of corruption. But what way do you think animals could die that God would say it was meod tob or “very good”? I mean I know plants could “die” by animals eating them, so do you believe some animals ate each other? Elise, the Bible isn’t very clear on this subject, so it is hard to say. Prior to the Fall, it could be that some animals died of old age. There may not have been any suffering involved in such a death back then. I seriously doubt that animals ate one another before the Fall, as the Bible says that they all ate plants. Now the Bible doesn’t say they ate only plants, but I think that’s a reasonable conclusion from what the Bible does say. It might be incorrect, however, as some very serious, Bible-believing theologians say that this verse simply indicates that plants are the basis of the food chain, so when carnivores eat other animals, they are really eating energy that was once in plants. My main point is that the Bible doesn’t say anything about animal death before the Fall. Thus, it is wrong to make any firm conclusions about it. However if the Bible doesn’t say anything about animal death before the fall, then why should a person believe that animals died before it? How would the animals die, though? Do you believe that there was decay before the fall? Or did God simply kill a random animal here and there when He thought there were too many? Grace, it depends on what you mean by “decay.” If I start a pendulum swinging, it will swing back and forth with a constant period, but the amplitude will slowly decrease until the pendulum stops swinging entirely. That’s an example of decay, and I think that kind of decay existed prior to the fall. It’s possible that the lives of animals were like that before the Fall. If there was animal death before the Fall, it was most likely something like the stopping of a pendulum – a natural consequence of the laws of nature. This would not represent something that is “bad” or “not good,” it would just be a natural consequence of how God designed nature. The Bible clearly says that people are different from animals, so that same consequence would not have applied to people. Charles, the Bible does say that human death is a direct result of sin. The Greek in Romans 5 makes that very clear. In addition, the Bible also clearly says that plant death existed before the Fall (Genesis 1:29-30). Thus, the two things we know for sure is that human death is the direct consequence of sin and plant death is not. The Bible is silent on animal death and its relationship to the Fall. Now the Bible does say that all creation groans as a result of sin (Romans 8:22), but that probably doesn’t apply to animal death. After all, the verse is quite explicit that “the whole creation” groans. That would include plants, and there was plant death before the Fall. In addition, I think that “the whole creation” probably refers to everything, even things like rocks, dirt, the sun, etc., which are not alive. Thus, the groaning that Romans 8:22 refers to is probably not death. It is probably the overall suffering and decay that sin introduced into creation.